As part of the new Sheep Shack event in FarmVille 2, farmers are now encouraged to complete a series of quests called "Counting Sheep." There are eight quests in this series, and they require the use of some limited time crops in the store. That being the case, you'll want to start them as soon as possible to not get left behind. We're here with a guide to completing this quests, with some details thanks to V56. The Savoy Cabbage is available for the next 19 days, and it is planted for 50 coins per square. It takes four hours to grow, but remember, the Savoy Cabbage just needs to be planted in order to finish this quest. Completing this first quest gives you 400 coins and 20 XP. The Shepherd's Hooks are earned by posting a general news item to your wall, while the Wheat requires four hours to grow. Finally, the basic Baby White Sheep is available for 9,000 coins in the store, and it requires three Bottles to reach the Adult stage. Completing this quest gives you another 400 coins and 20 XP. The Felt Rolls are each created using four Wool inside the Crafting Workshop. For the Pickled Savoy Cabbage, you'll need to have 12 Savoy Cabbage and five Pickling Spice to create a single batch. The Pickling Spices are earned by sending out individual requests to your neighbors for help. You'll receive 400 coins and 20 XP for completing this quest. The Chamomile Teabags are earned via friends' help, while the Onions are planted for 22 coins each and take 12 hours to grow. The Orange Trees take eight hours to grow, so if you don't have five individual trees on your farm, and you don't want to wait for your existing trees to grow multiple times, you can purchase additional Orange Trees in the store for 300 coins each. Finishing this quest gives you another 400 coins and 20 XP. The Magenta Dye is crafted inside the Crafting Workshop using 12 Onions and three Flasks per batch. If you decide to sell them after, they go for 1,000 coins each. Meanwhile, the Orange Icing is created using three Oranges and one Stick of Butter. These sell for 340 coins in the market. You'll receive another 400 coins and 20 XP when you finish this fifth quest of eight. As we said before, the Felt Rolls are created using Wool in the Crafting Workshop. If you're still working on building your Sheep Shack, make sure to check out our complete guide to get caught up. Completing this quest gives you, you guessed it, 400 coins and 20 XP. The Pink Pig Toys are created using two Felt Rolls and one Magenta Dye each. They are sold for 2,480 coins each. As for the Wool Padding, these items are created using one Felt Roll and four Fine Sheep Fleece each. The Fine Sheep Fleece, meanwhile, is earned by tending Prized Sheep on your farm. You'll earn yet another bundle of 400 coins and 20 XP when you complete this quest. 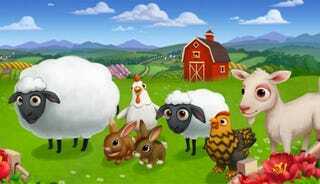 What do you think of this Counting Sheep quest series in FarmVille 2? Do you think you'll be able to finish them all before they expire? Sound off in the Games.com comments!